Event Chairman Mimi Greenlee provides oversight on the opening day of Westport Library's Summer Book Sale Saturday morning. WESTPORT — For the 25th straight year, the Westport Library will be peddling everything from mystery books to vinyl records with its “Almost Spring” book sale. “This year’s winter sale looks to be the largest we’ve ever had here at the library. 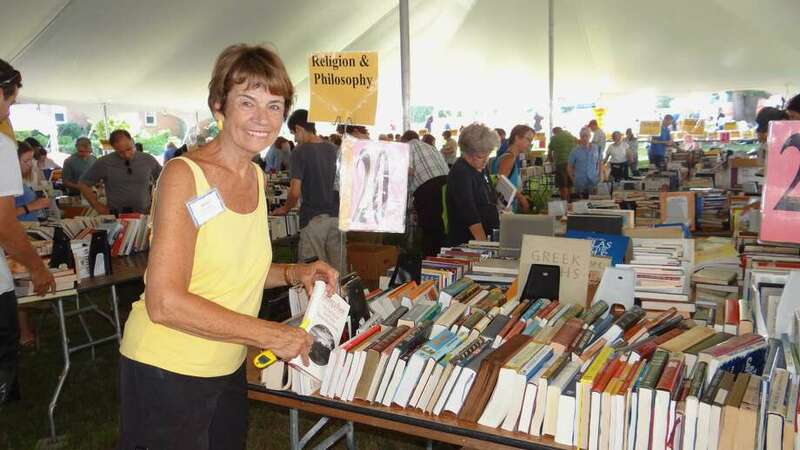 Thanks to the generous donations from the community that come in throughout the year and the tireless work of our volunteers we are able to offer a huge selection of thousands of items this year,” said Mimi Greenlee, the co-chair of the book sale which will take place from March 4 through March 7. The list of offerings includes: fiction, travel, biography, history, cooking, home, crafts, sports, test prep, DVDs, CDs, magazines and postage stamps. Held in the McManus room, all proceeds go to the library. The sale will take place on March 4 from 9 a.m. to 5 p.m.; March 5 from 1 to 5 p.m.; March 6 from 9 a.m. to 5 p.m.; and March 7 from 9 a.m. until 12 p.m. On March 6 everything at the sale is half-price.